Engineering Drawing laboratory and Engineering Workshops are related to other departments in the Faculty of Engineering and Technology. All these laboratories are used extensively for instructional purposes. Field lines, Ohm’s law, Wheatstone bridge, The Galvanometer Ammeter and Voltmeter, Kirchoff’s rules, Voltage division with potentiometer, Electrical Power, measurement of a capacitance, RC circuits and Faraday’s Laws. In the Circuits and Electronics Laboratory, second year students carry out experiments in circuits and electronics featuring diode and transistor circuits, amplifiers, op-amps, wave generators, and digital electronics. Projects in third year courses and during the final year are also built and tested in this lab. Equipment includes oscilloscopes, digital multi-meters, function generators, power supplies, and frequency counters. Components are available to build circuits ranging from a simple diode rectifier to complete microprocessor-based systems. 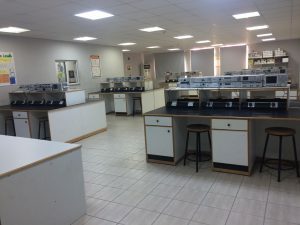 This laboratory is used by Electric Circuits Laboratory (0905 212), the Electronics Laboratory (0909 215), as well as for the Final Year Projects. In the Digital Systems Laboratory, students use digital integrated circuits, microprocessors, and FPGAs to build a variety of circuits and systems. The lab experiments enhance students’ knowledge of hardware description languages, computer architecture, assembly language, as well as I/O interfacing techniques. 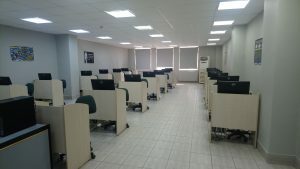 The lab is equipped with twelve computers as well as Xilinx and Altera FPGA boards and microprocessor programmers. 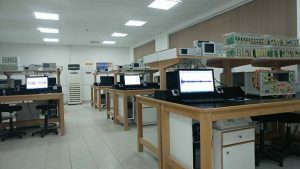 This laboratory is used for the Digital Logic Design Laboratory (0909 243), Computer Organization Lab (0909 247) and the Microprocessor Systems Laboratory (0909 446), as well as for the Final Year Projects. 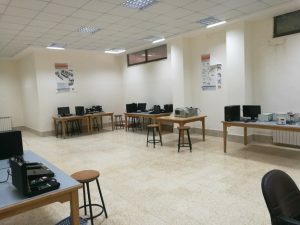 The Networking and embedded systems Laboratory is equipped with state of the art hardware and software that can be used to build local-area and wide-area computer networks, embedded systems with PIC16F917 development kits and Arduino kits. The lab has six complete stations each equipped with four Dell Power Edge 650 servers, as well as four Cisco routers and four 3Com hubs. Students use this lab to develop their skills in networking, router and server configurations, and internet protocols. The lab is also used for conducting research in this field. The laboratory is used to instruct the computer networks Laboratory (0909 463), Embedded System Lab (0909 548), Communications Networks and Electrical Wiring Lab. (0909 323) as well as the Final Year Projects. is available to students for instruction and project execution. Several computers are available. Scanners, plotters, and laser printers are also available. 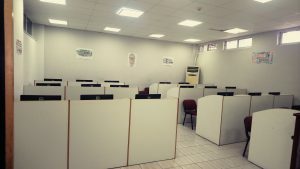 Additionally, working space and computer stations are available to computer and communications engineering students in the various laboratory and departmental facilities, described above. Students can connect to the University data network using the networked computers available in laboratories, or use their personal laptops or PDAs (Personal Digital Assistant) to connect to the campus-wide wireless network. In the Communications Laboratory, students carry out experiments in analog and digital modulation techniques. 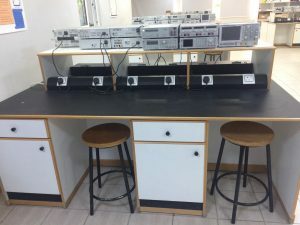 The laboratory is equipped with reconfigurable arbitrary generators and data acquisition boards that allow the generation and demodulation of any type of signal. These boards are controlled by a dedicated processor and specialized software. Courses using this laboratory include Communication systems Laboratory (0909 427), Digital Communications course (0901 428), Digital Communications lab (0909 533) as well as the Final Year Projects. 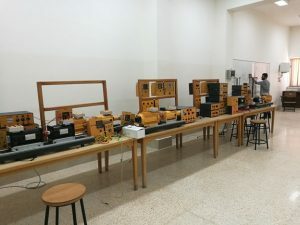 This course taught the theory of AC Synchronous Generators and Motors, which is then demonstrated with practical labs. Vector analysis of the synchronous machine and its effect on the grid system as well as the concept of infinite buss is covered in depth. Attention is given to the different types of construction methods of Synchronous machines and as well as the effect of these Construction methods on the Harmonic distortion. Power factor correction using synchronous machines in “Real World “situations are covered in depth.